Ornamental gourds are easy and fun to grow. They have been grown for centuries, both for using as a garden plants as well as for drying and using as both utensils and handcrafts. They are very long lasting once dried and are mostly used to carve, paint and craft into decorative pieces. Once cleaned and dried the external surface is very hard, yet easily carved with both hand and electric tools. Gourds are easy to grow from seeds and are a great way to obtain decorative gourds for musical instrument and crafts. Most are grown as vines and require a trellis or pergola to grow over. Best planted as the weather begins to warm up, although seeds can be germinated indoors or in a greenhouse to give a head start. Seeds can also be soaked overnight before planting to help speed germination. We suggest starting in individual pots and then transplanting once the seedling is looking healthy. 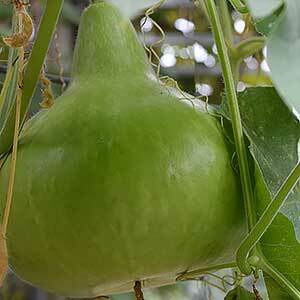 Keep plants watered through the growing season and you will have an abundant supply of gourds. Gourds have both male and female flowers, and pollination is important. Insects such as bees are natural pollinators, however they will also cross pollinate. Cross pollination means you may not grow the gourd type that you want, so hand pollination may be carried out. You will need a small paintbrush. Look for the flower without a small ball at the base, this is the male flower. Use the paintbrush to collect some pollen and then paint this into the centre of female flower (the ones with the ball at the base of the flower). 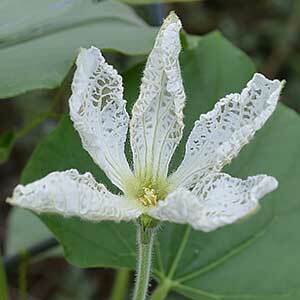 Luffa – This is a variety that has edible fruit if picked when young. When the fruit matures and dries it is used as a vegetable sponge. Kiwano – Large yellow to green fruit that darkens to a bronze colour. It is covered with small spikes which interest when dried. Bouteille Bianca – Rounded fruit almost white in colour as the name suggests. Green Bottle Gourd – Widely used for decoration and carving. Apple Gourds – Green and used for carving and craft. Others include: Cucurbita Gourds, Lagenaria Gourds, Plate de Corse, African Kettle, Long Handle, Dinosaur Gourds, Speckled Snake and the rare Gakhaa. . Gourds are used for decorative purposes sometimes with intricate etched design, water jugs, musical instruments, including, maracas and marimbas.